Perhaps you just purchased an old house (congratulations!) or maybe you've lived in one for some time and have grown curious about its history. Where do you start? It's always a good idea to first read up on your town's history. It's useful information to know if your town changed names or counties over the years, annexed land, or had certain development patterns. This comes in handy when you do keyword searches later on. Does the landscape include mature trees or flower beds where a house no longer stands? Maybe there are granite steps leading to nowhere, or a cow run connecting a barn long since gone to a pasture since grown up. Inside, look for details like doors, exposed nails, or framing. These things can help pinpoint a construction date. If your house is more recent (say after WWII), look for catalogs online that advertise materials like linoleum, metal cabinets, or louvered windows. This house in Enfield Center has a Victorian-era porch added to an otherwise Greek Revival cape. Not all houses were photographed back in the day, but chances are your local historical society or library may have a good collection of images. Having historic photographs is very helpful in determining when things were added or removed from your house. You may be able to find photographs from lifelong residents, neighbors, or former inhabitants, too. If you're looking for images from the 1970s onward, you may have luck looking through old tax card photos at your town office. If you live in a grander house, or one with a prominent owner, try using Google Books or archive.org using keywords like your town, address, names of previous owners, and occupations. You never know if an agricultural journal profiled Farmer John Kimball or if an architectural trade magazine highlighted your house. Historic images show that this Greek Revival house in East Grafton once had an earlier cape (background), ell, and barn. c.1860 Walling Maps were cadastral maps made at the county level, and many are available online at the Library of Congress. If you don't see your county listed, you may have better luck finding one in person (they're on display at the NH State Library, in many county offices, and at some historical society museums). c.1890 Hurd Maps are also wonderful cadastral maps worth exploring, and are available through the David Rumsey Map Collection. Sanborn Fire Insurance maps were made for insurance companies to assess risk between the 1880s and 1920s. They're most common in densely settled areas, or where industry was located, but they reveal interesting context. Dartmouth has digitized an extensive collection, and those are available for here. They're also available at the Library of Congress website. Birds Eye Maps are drawings of towns, often made in the decades after the Civil War. Many are available at the Library of Congress website, or by doing online searches. If your house is very old, or if you want to research land owners before your house was built, the NH Historical Society has many towns' early proprietor maps, which show how towns were divvied up into ranges and lots. Deed research is a good step once you fully understand your property and have some names associated with it. While some counties offer online searches, not all counties are the same. It's sometimes worth it to travel to your county seat and spend an afternoon poring through paper records; this way if you get stuck (and you very well might if your property history has subdivisions and hard-to-read print), you can ask the registrar experts for help. If you don't have an account to Ancestry, consider spending a day at a nearby library, university, or historical society that does have an account. Census data is the best way to understand who lived in your house. While the sorts of data collected changes between decades, you'll be able to determine things like the ages and professions of your house's previous owners. Three things to note about the census: some census data is missing due to archival fires at the federal level (1890 especially, but also 1820 for some towns in Grafton, Rockingham, and Strafford Counties); census search engines sometimes cannot translate the handwritten names, so it's worth it to look at your town's entire sheet or enter in old neighbors' surnames that are easy to translate and look from there; and the public can only search up to the year 1940. If you know that your earlier homeowners were farmers of millers, there's a good chance you can find additional information about them through the Industrial and Agricultural Schedules. These were done in 1850, 1860, 1870, and 1880 and provide details about the amount of corn, cheese, and carded wool your person of interest produced. This data isn't available online, so head to the NH State Library's genealogical room where it's on microfiche. City directories (many available online or at the local library) are great resources if you live in a more urban area, or if you've discovered that your house once doubled as a lawyer's or doctor's office. 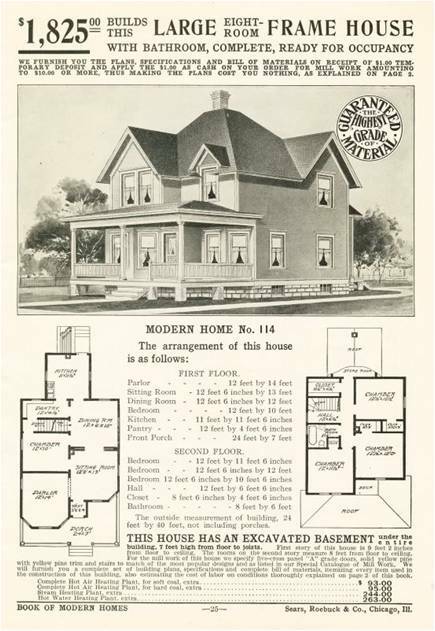 If you suspect your house was built from a kit (likely if it dates from the early 1900s), try searching online for catalogs that may include its design. There will be clues in your house, too: look for labels or stamps on lumber or on the back of trim. Sears and Roebuck was just one of many mail-order companies, so keep your searches broad at first. Oral history can be a great way to connect to your house's more recent history. Ask old timers in town (or maybe you are the old timer - in that case, write it down!) or former inhabitants about quirks you've noticed. Even the mundane can prove interesting. With your collection of keywords, enter in names of owners into Google Books or other online databases. You never know what will come up. Maybe someone was a master of a local grange, a suffragette, or a state representative. This "Concord" model house came from a 1924 Sears and Roebuck catalog. Lyme Center. When you feel like you've researched all you can research, consider listing your house to the National or State Register of Historic Places. Both are honorary programs, which means that they don't come with regulation. By joining the historic register, though, you're providing greater context to our state's architectural history - which is very helpful for professionals and other homeowners. You should also type all of your findings and create a report to pass on to the local historical society or next stewards. And remember, what you do to your house will add to its history. Leave behind photographs for your local historical society and record changes that you make. The future will thank you. You can find a list of these compiled resources - and more - here and another one here.